"Brigham Young quarterback Max Hall is lifted by fans after defeating University of Utah, 26-23, in overtime during an NCAA college football game Saturday, Nov. 28, 2009, at LaVell Edwards Stadium in Provo, Utah." Just when I thought I wouldn't be covering many sporting events since I am back on the morning shift, I get a great weekend of BYU sports, obviously ending with a huge in state rivalry win over Utah. Not that exciting of a game, but great, fun environment hanging and shooting with a bunch of amazing shooters including the Salt Lake Tribune and Deseret News. 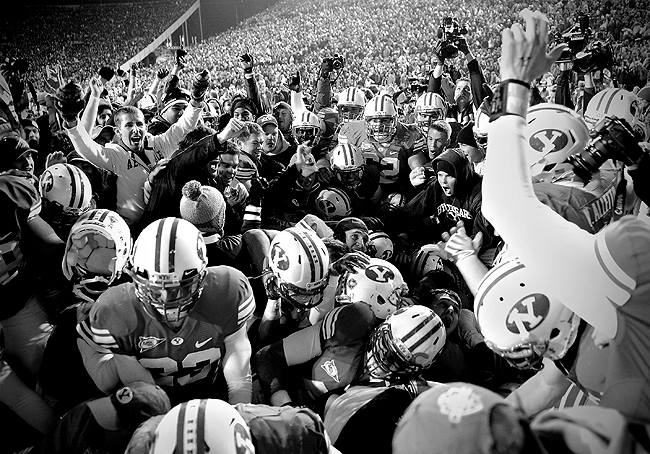 Despite the bland action, the field getting rushed after the overtime touchdown was something to remember. I have never witnessed a field being rush, especially with a crowd of more than 60,000. The fans went crazy right after the winning touchdown and it was something else trying to keep myself and cameras safe in the scrum. 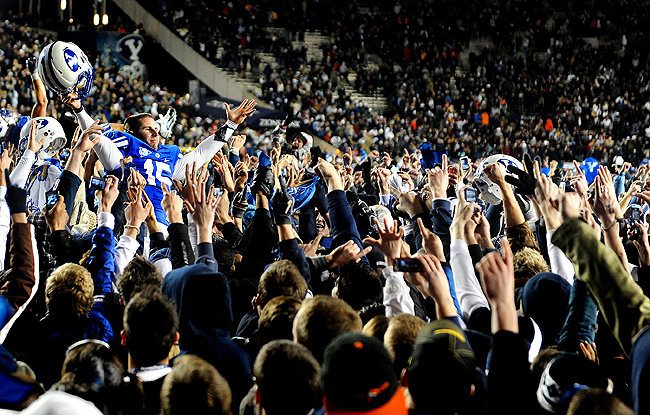 Hopefully I'll be making the trip to the Vegas Bowl, if I end up working, and that’s the bowl BYU ends up going to. All in all, a hectic, yet fun night to end football season. edit: I originally liked this frame converted, but I've changed my mind after a couple friends said it's better in color. 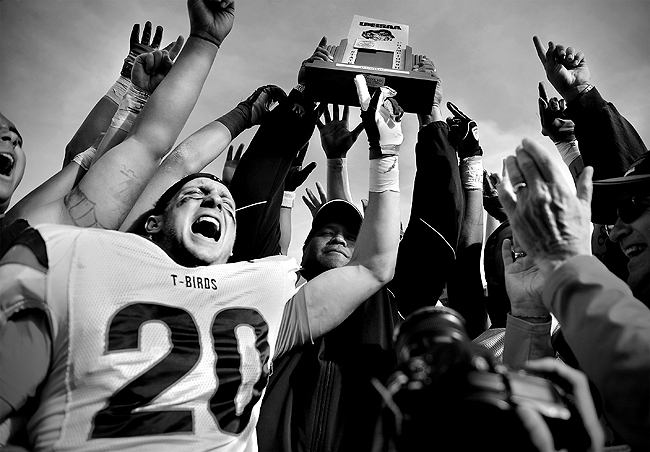 "Timpview's head coach Louis Wong (center) and Chris Badger (No.20) soak in the moment as the T-Birds celebrate their fourth straight state title after they defeated Springville, 35-6, in the Utah State 4A football championship at University of Utah's Rice-Eccles Stadium, Friday, Nov. 20, 2009." Even being new to Utah (am I still allowed to say that? ), one can’t really be surprised that Timpview won yet another state title. Yep, their fourth straight. I won’t lie though, I shot a handful of Springville games this season and deep down inside was rooting for them (despite my objectivity). I bet their celebration would have been way more epic than Timpview’s team jube. Timpview is probably sick of celebrating. And I cannot help that Chris Badger decided to get into my pictures all week long. "Brigham Young's Manase Tonga (No.11) is crushed by Air Force defenders during the third quarter at LaVell Edwards Stadium in Provo, Utah, Saturday, Nov. 21, 2009. BYU won, 38-21." Back on the day shift, which means I am back to working Saturdays. If one thing comes good of getting up early all week, it's ending the work week with action packed BYU football. Not to mention, the media food is proclaimed the "best in the country" despite the sodium overload of various salted meats and post game tooth-rotting sugar glazed doughnuts. This week, the game was nothing to write home about, unless you were Max Hall or Harvey Unga, who both surpassed previously held BYU records. I'll be back out there next week for the big Utah rivalry between BYU and Utah. In the meantime, here are a couple frames from the 20 or so I moved after the game. 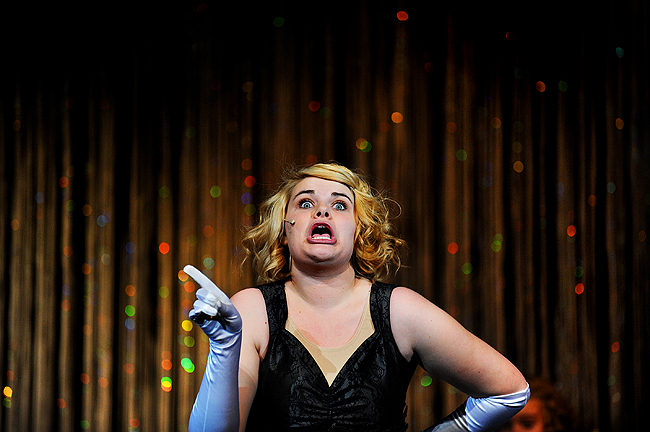 "Melinda Furr, who plays "Allison," rehearses a scene from Mountain View High drama's production of "Guys & Dolls" at Mountain View High School, Friday, Nov. 13, 2009. The show runs Nov. 19-21 and 23." I should have been an actor. Or that's what I always think that when I shoot performances. 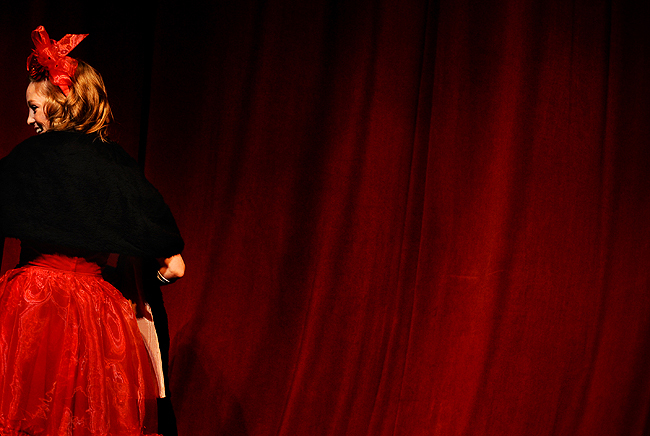 While not a huge fan of actually seeing theater, when I get to photograph them with good access I enjoy myself. Sure, it's entertainment, it's all going to happen the same way every time. It's scripted. From the costumes, the lines, the blocking, the light, you name it, it's going down the same way every night until close. But one cannot complain though. It's always graphic and the light is always perfect. Add those two elements with access to anywhere to you want to go and you can make some nice graphic images. This was a rehearsal and while I dreaded it at first, I left with a smile on my face. However, after seeing the article in print and online I wasn't smiling. The above image and this image not only didn't make the print edition, but they were for some reason cut from the online gallery, too. "Matt Codina pedals around on the top level of the Wells Fargo parking garage in Provo on his fixed gear bicycle, Tuesday, Nov. 3, 2009. 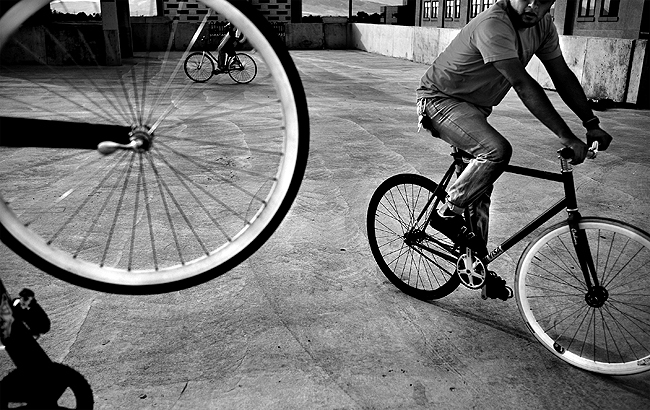 Fixed geared bicycles, or fixies, are old-school racing bicycles. They are light, fast and feature literally no bells and whistles - No brakes, one gear and no coasting." I was frustrated with trying to ride my heavy mountain bike on the road, so on a whim I found a great deal on a fixed gear bicycle (Photo by Chris Detrick) in some local Utah classified. The day I purchased it, I took it down to work to hopefully ride around when not shooting. But then I was given an assignment literally a couple blocks away. So I hopped on my bicycle and pedaled away. 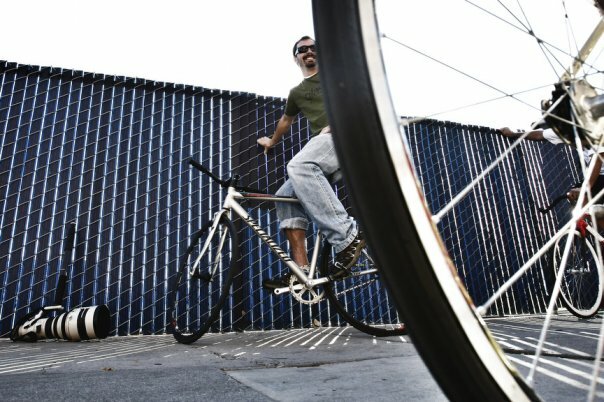 While shooting a building mug shot, a guy on a green fixie rode by me. Intrigued, I pedaled over and started talking with him. Without boring you with unneeded words, I turned my new obsession for riding a fixed gear bicycle into my November Monday Close-up. The guys I followed for a couple days were an awesome group of dudes and not only did I have fun shooting stills, video and writing the article, but I learned a lot. Wish my video would have came together a little better, but it is what it is. More photos to come. You can check the article here and the video here. 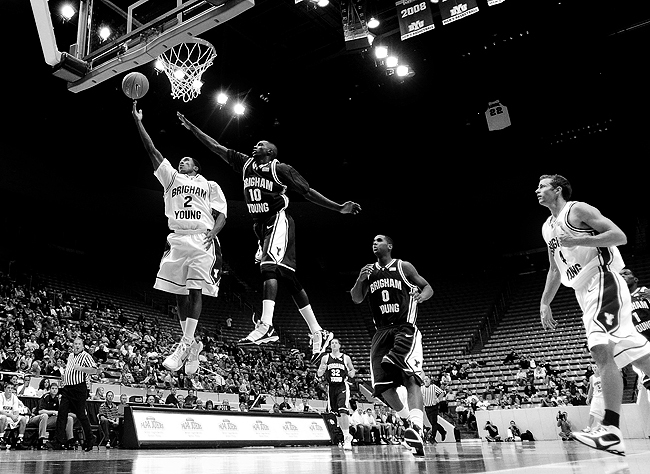 "Bradley guard Dodie Dunson (No.2) lines up a shot at the buzzer as Brigham Young Charles Abouo (No.1) attempts a block in the first half at the Marriott Center on BYU campus, Friday, Nov. 13, 2009, in Provo, Utah. BYU won, 70-60." Well, to say it was BYU's season opener may be factual, but it was not really in my eyes since I shot their inner-squad game a week before. I am not a fan of shooting basketball, something bothers me about about sitting on a hard floor all game, but I have a feeling I am going to grow into a big fan due to the great light at the Marriott Center. It's by far some of the best arena lighting I've ever witnessed and cannot wait to get some remotes up for future games. 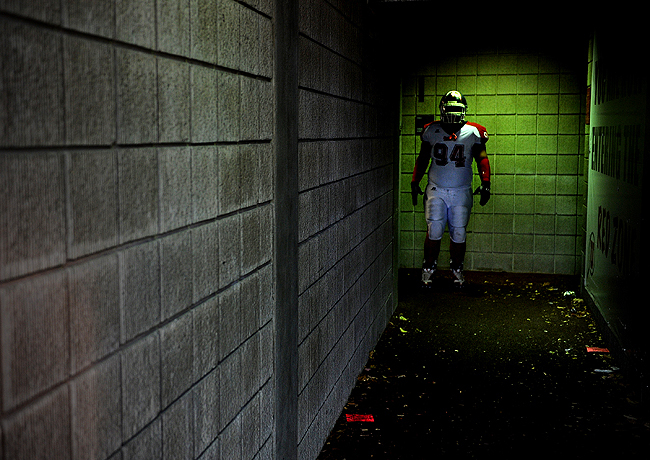 This was my favorite frame from the game, which I snapped right before the end of the first half. Ended up moving images for a better part of the second half to the paper and AP and then went out for the last eight minutes or so even though our deadline was well past. 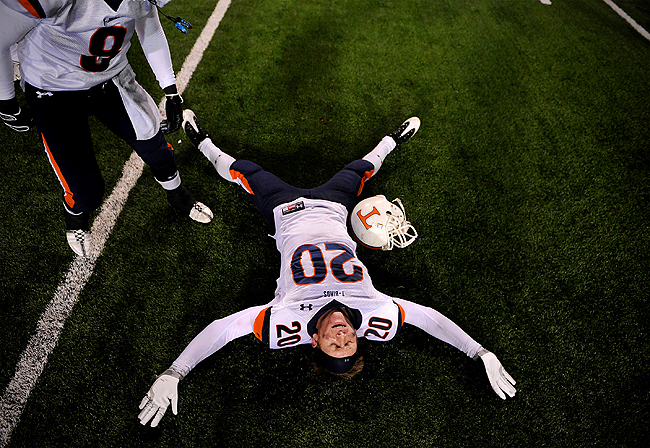 "Timpview's Chris Badger (No.20) does "snow angels" on the field after defeating Mountain Crest in the Utah State 4A football semifinals at University of Utah's Rice-Eccles Stadium, Thursday, Nov. 12, 2009. 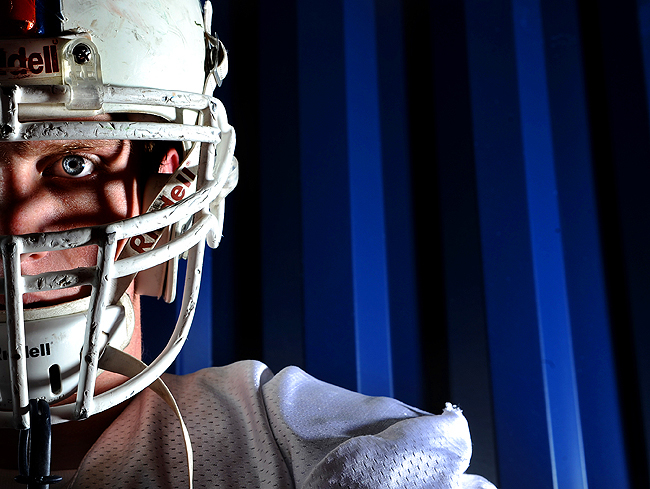 Timpview won, 38-21,advancing to the state championship game against fellow Utah County team, Springville." After the first game I was covering, rain started to fall and it got cold. This game was much better than the first though despite the rain. 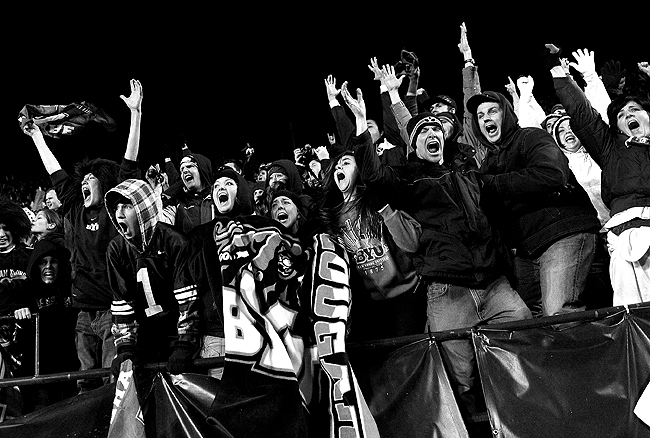 I found this except on the NY Times Lens Blog, and thought it was fitting: "As Walter Iooss and Neil Leifer will tell you, sports photographers have good games and bad games. Like athletes, they get better through intense competition." Well, as mentioned, the first game was horrible. I had to get better as more and more photographers lined the side lines. Chris Badger again was photographed by me after he decided to do "snow angles" on the field as the final seconds ticked off the clock. A couple minutes later, Badger and more teammates did it again, and Chris was right there is make a better frame (although he hasn't posted it yet) of the situation although it was the second time they did it. "Springville takes the field against Dixie in the Utah State 4A football semifinals at University of Utah's Rice-Eccles Stadium, Thursday, Nov. 12, 2009. Springville won, 29-21, advancing to the state championship game." 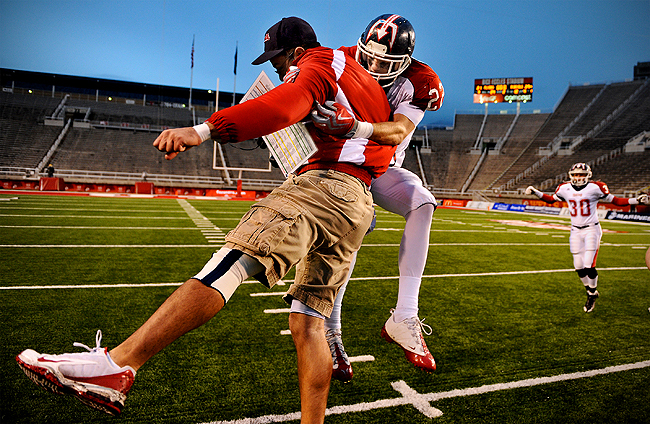 Last week I shot back-to-back Utah state championship semifinal football games. It was nice only having to drive five minutes to my only two assignments of the day. The first game I am not sure what happen. After making some pre-game frames, things didn't go in my favor. I don't know if I wasn't putting myself into the right positions, or if the action rarely came my way, but I didn't enjoy myself one bit. While the game seemed like a blow out, a late run by Dixie gave Springville a scare as they thought they'd easily be in the 4A championship game. Needless to say, they were pretty amped they won. "Timpview defensive back Chris Badger hopes to help lead the T’Birds to a fourth straight Utah 4A state football championship. They face Springville Friday, Nov.11." The odd thing about me, is when I first started shooting photos I was heavy on lighting everything. I was, if you will, a Strobist. When I first started I was terrified of people and can distinctly remember sweating buckets when I was one-on-one with subjects for a portrait. In addition, I could remember racking my brain trying to figure out all the sweet ways I could light a subject. I'd sit all night (read: every waking moment I had in advance) trying to think how I'd shoot, let's say, one football player. I'd put a lot of time an effort into planning the perfect shoot. But things have vastly changed with my ways of shooting since my start. Not only do I not use my lights, pretty much never, but I love meeting new people and sitting down to chat with them before even shooting a frame. Nowadays, I just go with the flow when given an assignment or sportrait. Much like last week. Although I only knew about it 30 minutes before shooting it, I simply took work's lighting kit, in addition with my small strobe kit, and headed over to Timpview High School. 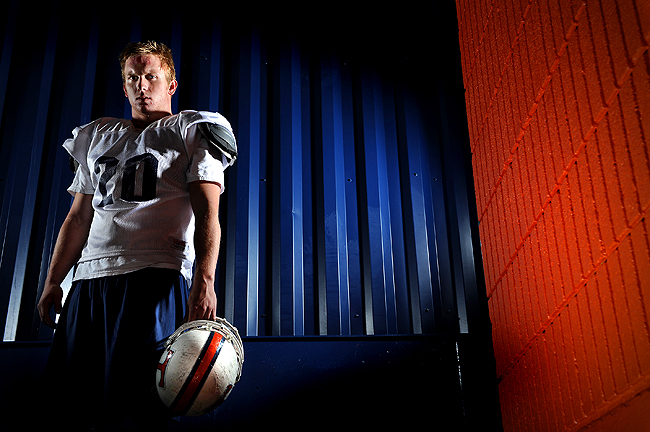 After five minutes of prep with my hand standing in as a model, I gathered Timpview defensive Chris Badger, shot as I saw it, and let him get on his way. The above ran lead, although I originally liked this one better. So I guess sportraits are my exception to using lights still. Who knows, maybe one day I'll be back to using them more again. Edit: Ironic. Trent talks a little about the same being an improv photographer, and he lit his picture in his post. Check it out. 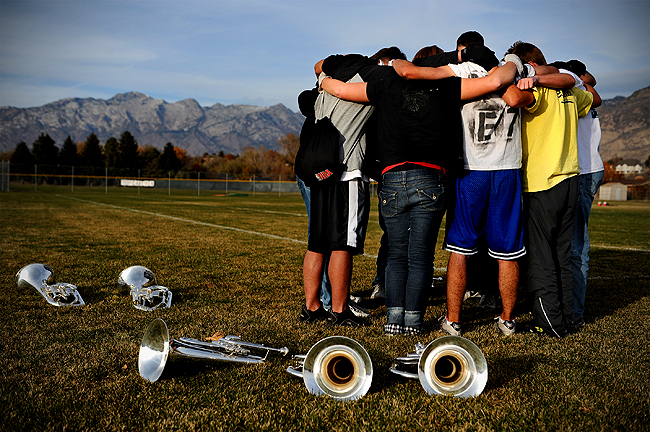 "Grief-stricken American Fork baritone marching band members pray on the practice field at American Fork High School, Monday, Nov. 9, 2009. In October, their woodwind instructor Heather Christensen was killed in a bus accident. The band is trying to raise quarter million dollars in donations to go to Grand Nationals with Christensen in their memory. Many sections of the band decided to go home to try and raise money, while while others remained to practice and build unity." What's to say? This band has been through a lot, yet has also made it so far. After a tragic bus accident, then winning an emotional competition to qualify them for the Bands of America Grand National Championships in Indianapolis, to trying to raise a quarter million dollars in two days, they continue to achieve. Earlier this week, the band raised more than $225,000 in two days to make the trip to nationals. But that wasn't without thinking about the one they lost in the accident in October. It was a difficult assignment. I sat in on the meeting, watched tears fall, witnessed their plan to raise money. While many went home to try and get friends and family to help them raise money, some practiced, others met as sections to talk. I was sent to take pictures of them rehearsing, but I felt there was more beyond that. I waited patiently for a telling moment and shot maybe 30 frames the entire time there. But I think it paid off. And despite the mood, I thought color still worked. Thoughts? After the article ran, not only did they raise the money, but the American Fork Marching Band has qualified for the semifinals of the Bands of America Grand National Championships. The band will perform again today. The field competition will feature roughly 36 bands, and then 12 bands will then advance to Finals on Saturday evening. I wish them much luck. 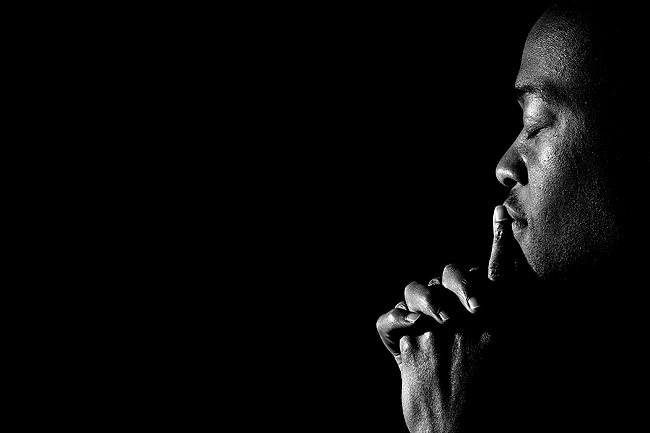 "Danor Gerald poses for a portrait for his soon to be released motivational, spiritual CD at the Provo Daily Herald studio Wednesday afternoon." Mark was shooting some pictures of a former Herald employee Danor Gerald who has a motivational, spiritual CD coming out. He was looking for some new head shots and Mark was summoned to the task. While he had everything under control, I thought I'd watch and help a little bit. In helping direct Gerald, I picked up the camera at the end of the shoot to play around with an idea I had in mind. Maybe not the CD cover worthy, but thought it may be nice for the back or inside art. edit: This picture ended up on the CD itself. Awesome! 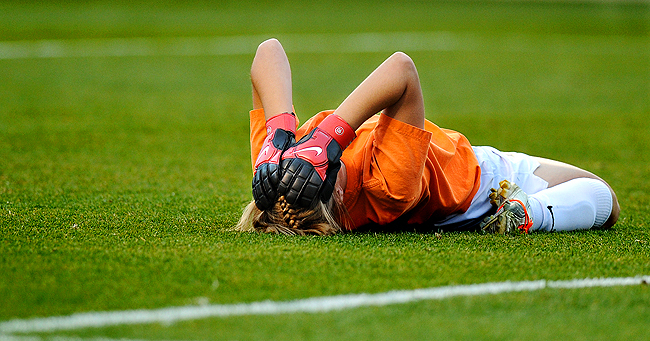 "Bonneville goalie Kelsey Bentley sheds her pain after Timpanogos scored the game winning goal against Bonneville with less than a minute remaining in the game during the Utah 4A girls soccer finals at Rio Tinto Stadium, Friday eveing. 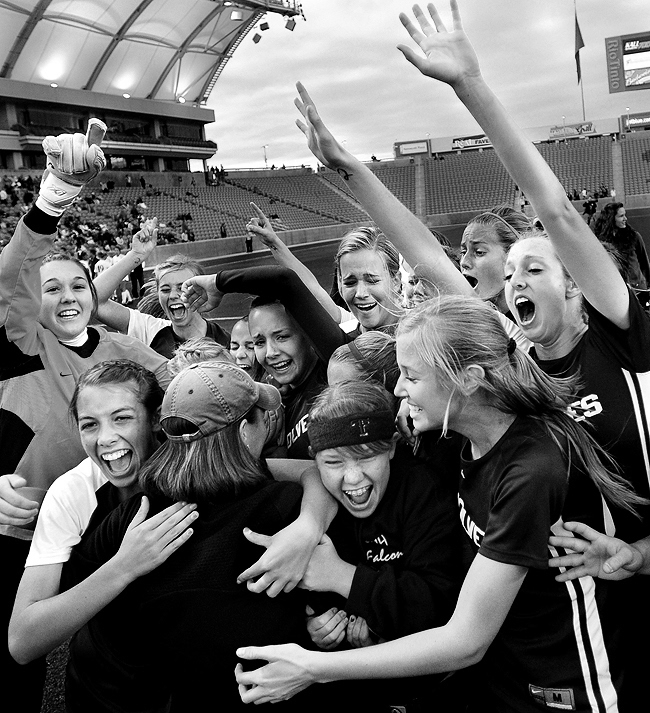 Timpanogos won, 2-1, and were crowned the 2009 4A state champions. " A couple weeks ago I didn't have fun at my assignment. Why? I was deathly ill. To be honest, I have no idea where it stemmed from. All day prior I had been feeling great. As the day progressed I got a killer headache and just began feeling horrible. 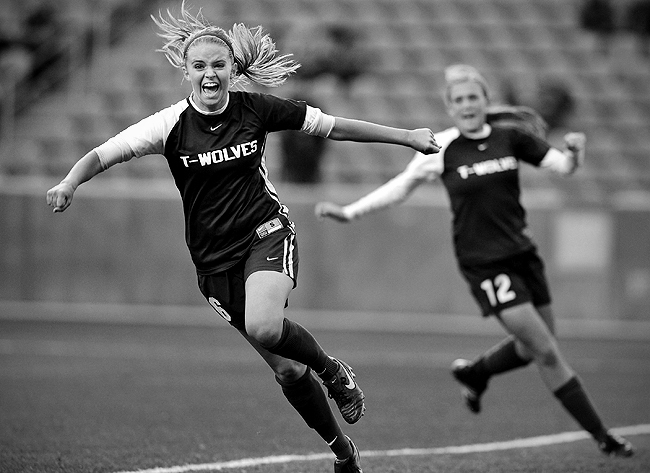 My assignment was to cover the 4A state girls soccer championship. But I couldn't really concentrate feeling as horrible as I did. I was pretty upset that I was ill and was covering a game that would boast some great emotions, celebrations and great light. At one point even thought about leaving because I felt so bad, but knew I had to do my job. Alas, my frames weren't up to par and I ended up talking to my toilet and bathroom floor all night. Luckily, sports seasons come and go, there will always be more championship games. 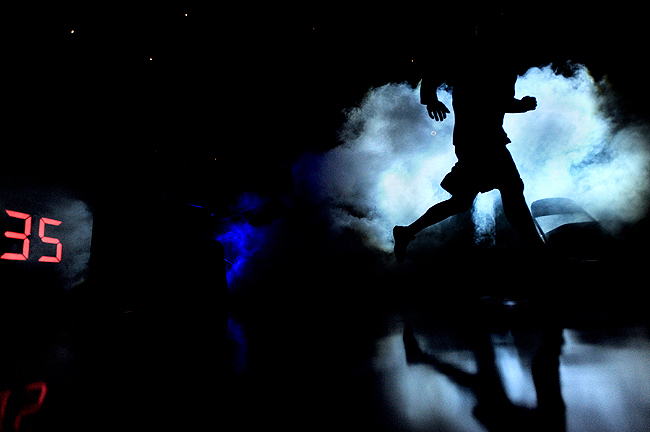 "A BYU player take the court prior to the BYU men's basketball Cougar Tip-Off at the Marriott Center on BYU campus, Wednesday, Oct. 28, 2009." Been working on a story that is running Monday so I have been sort of ignoring the blog. Posts are starting to age quickly. It's just about winter here in Utah despite the lovely 60-70 degree days we've been having. What I mean is that fall sports are either wrapped up or wrapping up. So basketball and wrestling season is around the corner. I covered the BYU inter-squad match last week. Not very excited to be sitting on a hard floor covering basketball again, but the lighting is really nice in the arena, and the AD seems open to remotes. The above and this frame were my favorites from the first half I stayed for. "Wrestler "Dallas Murdock" peeks through the curtain at Hubbard's match during Nightmare on Vine at South Valley Boys and Girls Club in Murray, Utah, Saturday, Oct. 3 2009. Many wrestlers watched Hubbard's match from back stage." Been having friends and my brother crashing at my place, so I haven't been able to work on putting anything new up as I play house guest and tour guide. Not to mention I've been working on my next Monday Close Up. Been trying to get all of my wrestling outtakes up as one post, but still toning some. I liked this one and thought it would be a teaser to more wrestling photos to come. 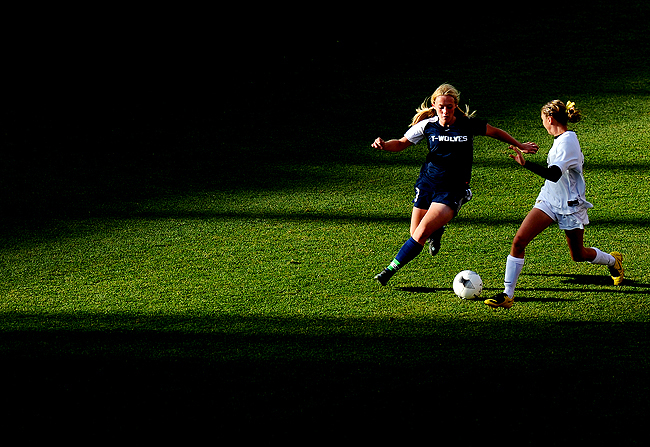 "New Mexico defender Elizabeth Lambert (No.15) clinches her first after deflecting the ball from BYU forward Carlee Payne (No.7) during second half in the MWC tournament semifinals at South Field at BYU, Thursday, Nov. 5, 2009. BYU won, 1-0, advancing them to the MWC finals." I was covering the Thursday’s Mountain West Conference Tournament semifinal contest between the BYU Cougars and New Mexico Lobos when all hell broke loose. What was a normal first half of soccer turned into one of the cheapest, dirtiest soccer games I've ever seen. And with that said, I've played all my life, watched countless games, and to this day still play. This brutal match-up started when New Mexico defender Elizabeth Lambert gave BYU forward Carlee Payne a punch to the back when jostling off ball. Knowing the game, I knew I'd better focus on Lambert when she was in the box during free kicks and off the ball. Then it happened. A hair-pulling, ponytail take down that could have easily left a BYU forward Kassidy Shumway with a broken neck. Now, that play is burned in my brain, not because of how viscous it was, but because I had the wrong angle and wasn’t fast enough. Although anticipating it, my placement left me with the backs of both players. Things didn't get any better as the game went on either. The above play (5 frames taken from the 11 sequence which the Daily Herald today) was my cleanest, clear blatant foul by Lambert, aside from a take down we ran the day after the game. I could talk more on this, but if you want to see it all, check out ESPN's video here. "American Fork runner Austin West is smothered by his teammates including Danielle West (center) and Morgan Warner after finishing first place in the 2009 Utah UHSAA State 5A Boy's 3-mile cross country meet at Highland High School and Sugar House Park in Salt Lake City, Wednesday, Oct. 21, 2009." Recently I shot the Utah state championship cross country meet in Salt Lake. It was my second time covering cross country, or as they call it XC, and had an OK time shooting it. I looked at images in our system of how photogs in the past shot it and I wanted to bring my own vision to the table and shoot completely different. From what I saw it was shot all vertical with a 400mm super tight last year. With that in mind, I decided to shoot primary with a wide and focus more on reactions and moments rather than runners, well, running. Although I think I shot it better my first time around in Baltimore County, I still thought these images told the story of the day: exhaustion, jubilation for Utah County and running. Probably too many features in this edit, especially compared to my last time shooting. 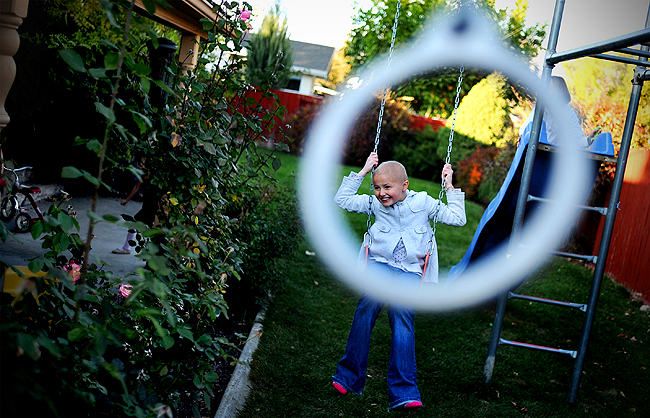 "Hannah Laursen, 9, of Provo, plays in her backyard with her sisters, Thursday afternoon. In June, she was diagnosed with brain cancer after finding a tumor in her brain. A benefit concert will be held in her honor at UVU this week." It's amazing the people I get to meet on a daily basis and how they make me cherish life much more and make me easily erase bad days and stress that in the end are meaningless. Last week I got to hang out with Hannah Laursen, a typical 9-year-old girl living in Provo. The one thing that makes Hannah different than her peers is that she has been through a lot - a lot of medical treatments no one should ever have to experience, let alone a young girl of her age. In June, she was diagnosed with brain cancer after finding a tumor in her brain. Over a period of six days, Hannah endured three separate surgeries to relieve the pressure on her brain and remove as much of the tumor as possible. A biopsy revealed it to be a malignant and rapidly growing tumor. Since returning to Utah the second week in July, Hannah has undergone two rounds of chemotherapy and a month's worth of five-days-a-week radiation treatments. But her spirits are high and her energy is returning. Hannah's positive outlook on her situation has been one of her greatest allies in her battle for health her father said. It was recently discovered that her brain tumor was completely gone. While some medical attention will still be needed to cure all effects, it's a great sign. I wish Hannah the best and thank her for allowing me to hang out with her. It was uplifting to say the least. 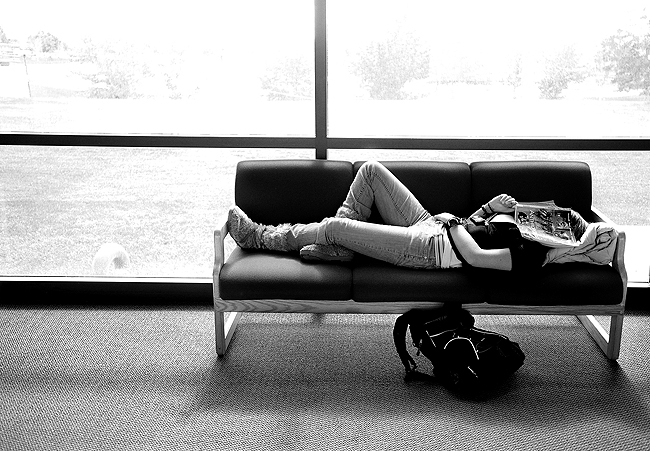 "A student tries to shed light as she naps at the University of Utah Valley, Monday morning." Sorry for lack of posts. This photo is what I feel like after spending the last two days driving and walking around some family around Utah. I played tour guide and I am exhausted. I am way more tired than I would be on let's say a four assignment day. I cannot wait to catch up on sleep after going back to work tomorrow.